How significant was the Woodstock Festival in 1969? It was more than just a rock festival, but did it mark the apogee of the hippie movement, rather than a turning point in history? The Woodstock Festival lasted three days from 15 to 17 August 1969. It took place on Max Yasgur's 600 acre farm in Bethel, New York State, USA. Over 400,000 people attended; far more than the organisers expected, or wanted. The Woodstock Festival was advertised through conventional channels. However, news of the happening spread through the hippie movement in the US. It was the event of the hippie calendar. Numbers far exceeded the organisers' estimates and they declared the Festival free. They cut down fences and any anyone who wanted to was allowed in. Commercially Woodstock was a failure. There were huge traffic jams which gridlocked the area. Some of the performers were flown in by helicopter. The weather did not help and heavy rain turned the festival ground into a mud bath. Nevertheless, thousands of young people enjoyed the event. They were happy and in good spirits and surprised the older generation. Commentators expected the Festival to be a disaster, but in the end they were pleasantly surprised and praised the young people's good humour and the peaceful nature of the event. For many young people the event was about more than music. Would Woodstock be 'the first free city in the world', or the birth of a new nation? There were high hopes that something lasting would come out of the Festival. In the late sixties, particularly in America, there was a huge gulf between the values and ideals of a large number of young people and the views of their parents. Young people believed they had nothing to learn from the experiences of the older generation and no interest in a society that created nuclear weapons and the Vietnam War. The Vietnam War was the focus of discontent amongst the youth of America. Many were being asked to lay down their lives for a cause they did not believe in. Is it any wonder? The other big gulf between the generations was the choice of drugs. The adults stuck to alcohol and tobacco. The hippie movement professed to marijuana, hash and LSD. Drugs circulated freely around Woodstock and organisers took to the stage to warn of 'bad acid' being circulated around. Participants took speed and pot, as well as LSD. There was one death at the Festival due to a drugs overdose and another due to a car accident. There were also two births. In the traffic jams to the Woodstock Festival there were VW Beetles, the odd VW Camper and one or two ancient buses. However the majority of road travellers arrived in new looking, large American saloons. Whilst a number of young people opted out of the American consumer culture and lived in small groups of hippies, the majority were either full-time students, had full-time jobs or relied on their parents to support their lifestyle. In the end Woodstock was mainly about the music. There was the seminal performance by Jimmy Hendrix of the Star Spangled Banner on electric guitar. The piece added rocket and explosive sounds to the American National Anthem. It became a symbol of the counter culture and anti-Vietnam War sentiment of the late 60s. Other acts which tuned in to the spirit of the 1969 included Jefferson Airplane, Janis Joplin and The Who. A taste of the future came from Sha na na, who performed a selection of hits from the 50s. They triggered a 50s nostalgia boom in the 70s, which spawned 'Happy Days' and Grease. In the UK, Malcolm McLaren founded the 50s revival store, 'Let it Rock' as a counter to hippie culture. He later evolved this rebellion against hippie ideals into Punk Rock. Was Woodstock about more than music? Elsewhere large festivals were less happy. Most historians contrast Woodstock with the Altamont Pop Festival in December 1969. At Altamont, San Francisco, the Rolling Stones staged a free concert. They misguidedly hired Hell's Angels as 'Security'. The Hells Angels killed at least one member of the audience. The hippy dream was unravelling. Birth of a new nation, no. 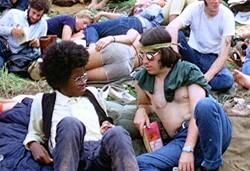 Hippie ideas influenced society well into the 1970s. The fashion and style also continued into the new decade. Today a liking for the natural and concern for the environment is stronger than ever. The documentary style film, Woodstock: The Director's Cut  presents a dispassionate view of the Festival, including interviews with locals, festival goers, police and organisers, as well as showing some, but not all, of the music. See also www.film.queensu.ca/Woodstock/, which contains some unique 8mm film of the Woodstock Festival.